The debate over Arizona's new illegal immigrant law will likely move from protest lines and talk shows to the courtroom, where a judge could be asked to decide whether the state can enforce laws that until now had been the federal government's exclusive domain. Republican Gov. Jan Brewer, who signed the bill on Friday, said Arizona must act because Washington has failed to stop the flow of illegal immigrants and drugs from Mexico. 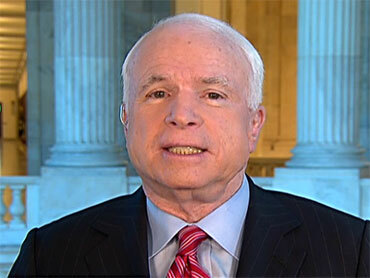 Republican Arizona Senator and former presidential candidate John McCain echoed that sentiment Tuesday. Opposition to the law grew Monday as opponents used refried beans to smear swastikas on the state Capitol, civil rights leaders and others demanded a boycott of the state, a petition drive began to put the measure to a public vote and the Obama administration weighed a possible legal challenge. "I do not want any discriminatory behavior," McCain told CBS News, saying he had spoken to senior law enforcement officers who told him "they think they can implement this law without racial profiling." Junior Perez, 19, has heard the assurances that the law is aimed only at illegal immigrants. He's not convinced. "If I'm a citizen or not, I'll always be Mexican," Perez told CBS News correspondent John Blackstone. He is a citizen, born in Arizona. His parents are legal immigrants from Mexico and are citizens, too. In a state where more than 30 percent of the population is Hispanic, many feel the sting of racism in the new law. "They're just focusing on us because we're brown, and it's devastating," said Perez. Jon Garrido, who produces a Hispanic website and ran unsuccessfully last year for Phoenix City Council, told The Arizona Republic Monday he pulled organizing papers for a petition drive to repeal the law. A referendum would require the signature of 76,682 registered voters to get on the November ballot. If successful, the effort would block the law from taking effect until the vote. President Obama, who warned last week that the measure could lead to police abuses, asked the Justice Department to complete a review of the law's implications before deciding how to proceed. A San Francisco lawmaker who came to the United States as an undocumented teenager plans to introduce legislation Tuesday calling for a citywide economic boycott of Arizona to protest the state's strict new immigration law. "We are not going to use our city resources to support that law," said Supervisor David Campos, who is himself an immigrant from Guatemala and became a U.S. citizen in 1997. Supporters of the law said it is necessary to protect Arizonans. The state is home to an estimated 460,000 illegal immigrants and is the nation's busiest gateway for people slipping into the country. Brewer has ordered state officials to develop a training course for officers to learn what constitutes reasonable suspicion that someone is in the U.S. illegally. San Francisco's city attorney has urged policymakers in the city to stop dealing with Arizona and Arizona businesses. Leaders in Mexico also demanded a boycott, as did civil rights leader Al Sharpton. During a town hall meeting Monday in Tucson, Brewer dismissed the threat of a boycott, saying she doesn't believe the law is "going to have the kind of economic impact that some people think it might," the Arizona Daily Star reported.